I bought this book because my son started reading Magic Treehouse books at #17 that had the dog in it, and he wanted to find out what happened to the dog. I guess #17-20 all talk about the dog that helps Jack and Annie, and you don't find out until the end of 20 what happens to him. As all the other MTH books, this one was an easy read and kept my son interested. The book arrived all bent up, but I have to keep it because I want it for my Granddaughter for Valentines Day. The other book has not arrived and I hope it get's here for Valentine's Day for my other Granddaughter (twins). They are really good books and we have a lot of them, but these two were missing. Both my daughter and younger sister adore this series. My daughter carries these books everywhere and even reads them out loud to her kitties, turtle, and lizards. It’s pretty cute. This series is truly the best. 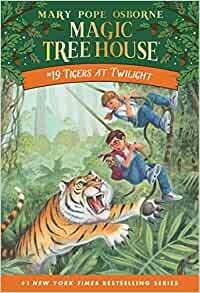 We really enjoy all of the books in the Magic Tree house series, but this was one of the best books in a long time. We have read all 18 books in the series, that proceed this one. We COMPLETELY and highly recommend this entire series... however if you don't read all the other books, you must read the First 4 books in the series, and this one. Now, my daughter and I are off to join Jack and Annie in Dingos at Dinnertime!